The brother of a Frederick Douglass High School student is accused of shooting a school employee on Friday afternoon. 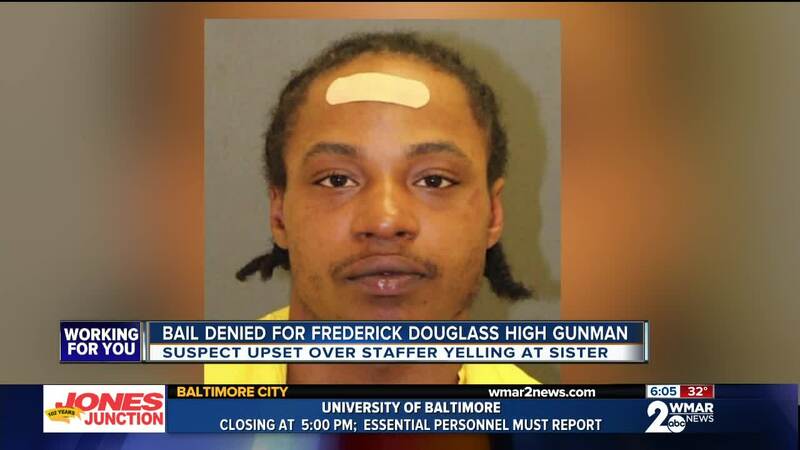 BALTIMORE — The brother of a Frederick Douglass High School student is accused of shooting a school employee on Friday afternoon. According to charging documents obtained by WMAR-2 News, police were already at the school when the shooting happened on Friday. The documents say an officer was called to the school around 11:30 a.m. after reports of a fight between two girl students. The principal reportedly asked the officer who responded to help de-escalate the situation, and while they were talking they heard shots fired right outside the office. The responding officer stated in the documents that he immediately took action and went out of the office to investigate. At the entry doorway, the officer said he saw two men fighting, Michael Marks, a school employee, and Neil Davis, the brother of one of the girls who was in the previous fight. In the documents it says Davis was still trying to break away from Marks, and Marks reportedly said, "He has a gun, I think I may have been shot." Davis was then reportedly taken to the ground and placed into custody, while Marks was taken to Shock Trauma to treat his gunshot wounds. The documents say he was shot twice in the right torso area. A Smith and Wesson .40 caliber gun was found on the floor about 10 feet away from Davis and Marks, even though Davis claimed he did not have a gun. Security footage police obtained reportedly shows Davis and Marks struggling in the main lobby of the school, and shows Davis with a black handgun, pointing it at Marks as they struggled. The documents say Marks was able to knock the gun out of Davis' hand after the shots were fired. The charging documents say police were able to speak with Marks at Shock Trauma. They say that Davis walked into the school and was asking for a "Coach Marks". When Marks said that was him, Davis allegedly became hostile and asked Marks why he was yelling at his little sister. Marks told police he tried to explain that he was disciplining her for being in the hallways during class and was trying to fight other students, but Davis took out a gun and shot him. The documents say Marks was shot, began fighting Davis in an attempt to disarm him, and then was shot again before he was able to knock the gun to the ground. No other injuries were reported during the shooting and witnesses were interviewed by police. Other charging documents from an incident on November 10 indicate this is not the first time Davis has used a gun to resolve and issue with his sister. According to those documents, Davis allegedly shot 25-year-old Darelle Yancey in retaliation for an assault involving Yancey inappropriately touching Davis' younger sister. A ballistics comparison was done, and police say shell casing found in both shootings. The Frederick Douglass shooting documents say the gun used during the shooting does not have a handgun permit issues by Maryland State Police, and Davis wasn't supposed to have it in the first place because of this previous incident. Davis is now being charged with multiple handgun and assault related charges. On Sunday, the decision was made to close Frederick Douglass High School Monday to "allow time to plan counseling and support for students following Friday's shooting at the school."